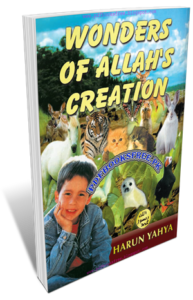 Wonders of Allah’s Creation authored by Harun Yahya, who was born in Ankara in 1956. He studied arts at Istanbul’s Mimar Sinan University and philosophy at Istanbul University. Since the 1980s, the author has published many books on faith related and scientific issues. Harun Yahya is well known as an author who has written very important works disclosing the invalidity of the theory of evolution. Some of the books of the author have been translated into English, German, French, Italian, Spanish, Portuguese, Albanian, Arabic, Polish, Russian, Bosnian, Indonesian, Turkey, Tatar, Urdu and Malay and published in the countries concerned. Harun Yahya’s books appeal to all people, Muslims and non-Muslims alike, regardless of their age, race, and nationality, as they center around one goal: to open the readers’ mind by presenting the signs of Allah’s eternal existence to them. How did the sun and the moon begin to exist? How did the seas, trees, and animals come about? Cherries, plums and Strawberries, emerge from the dark soil? Who gives them their colours and scents? make a honeycomb that has such smooth corners? Your mother gave birth to you. But the first human couldn’t have had a mother or a father. So how did the first human all of a sudden appear? In this book, you will learn the correct answer to all of these questions. Islamic English book “Wonders of Allah’s Creation” is now available here on Pakistan virtual library for online reading and download. Check out the following links to read online or download the complete book in high quality Pdf document format and enjoy offline reading.